We offer a watch battery replacement service whilst you wait and in most cases a battery and pressure test can be carried out within an hour. If your watch is water resistant it is crucial that a watch pressure test is completed every time the case is opened, whether it is to replace the battery or carry out an inspection or repair. Water and moisture can cause costly or irreparable damage to your watch. Our state of the art wet and dry testing equipment will pressurise all makes of watches, including divers watches to check that the case is water resistant to the required depth as specified by the manufacturer. 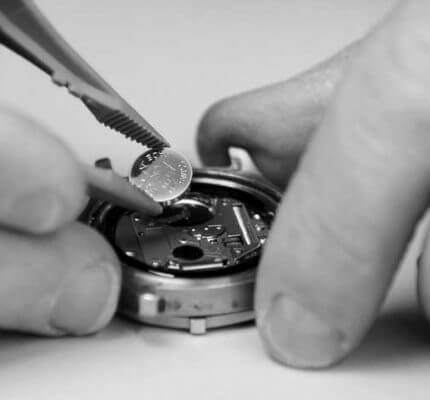 If we find that your watch has a leak we will provide a quotation to reseal it. On some occasions this may include replacing components such as the crown, pushers, glass and seals. We stock all sizes of watch battery and we can change the battery to all brands of watches whilst you wait. We offer a 12 month guarantee on all batteries that we fit. If we find that your watch has stopped for reasons other than requiring a new battery we will ask if you would like us to supply you with an estimate to put the watch back into working order.